Melissa Hyde submitted this photo and caption. My name is Melissa Hyde, and I was honored to spend my first summer as a member of a drum corps as the front ensemble captain for Teal Sound. This is a photo of Teal Sound's bass drum line during their infamous "battery wake-up" on the morning of the DCI World Championship Finals. 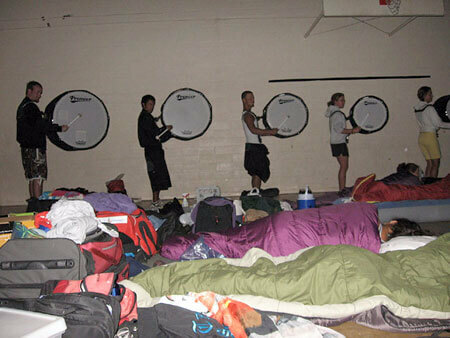 From what I've heard, this is a common practice among drum corps during the final week of the season. Having actually experienced it, it was awesome. This was a great way to get the corps pumped for our final performance of the season.